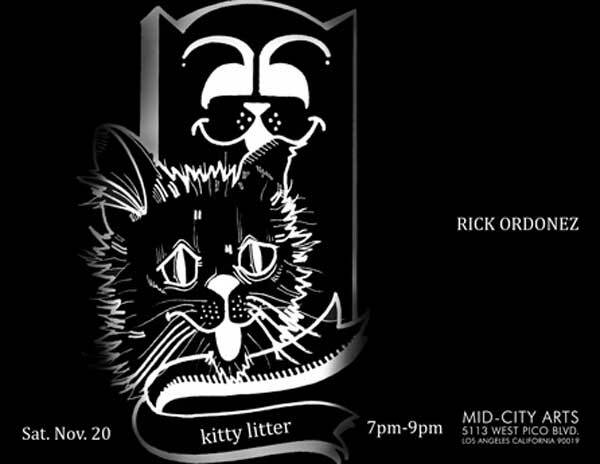 “Rick Ordonez: Kitty Litter”, an exhibition at Mid-City Arts, a street-art gallery in Los Angeles, features the work of a graffiti artist whose tags of cats have appeared across Los Angeles. His art, unfortunately, earned him 90 days in jail and 300 hours of community work. 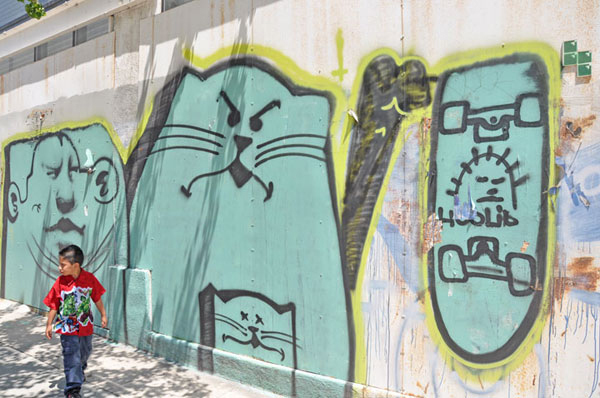 The long arm of the law intervened in July, when investigators with the Sheriff’s Transit Services Bureau caught up with Ordonez, 33, and busted him for creating cats on public property, especially on or near the Pasadena Freeway. The Sheriff’s Transit Services Bureau, which specializes in pursuing high-profile taggers, arrested Ordonez based on tips and information gathered in the community. 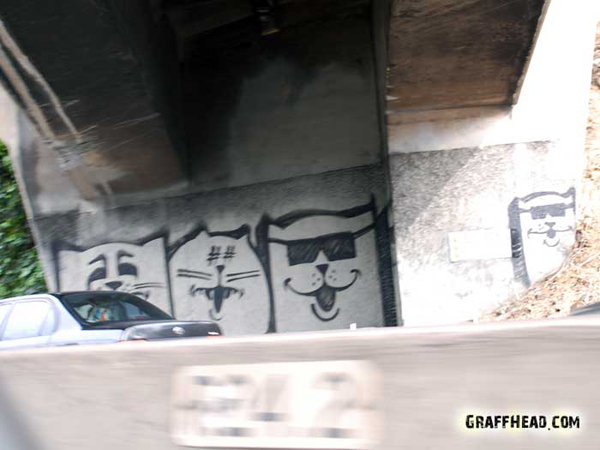 Most of the infamous cat paintings were plastered on state and local transit properties… According to investigators, Ordonez has associations with a tagging crew and is a cat owner. 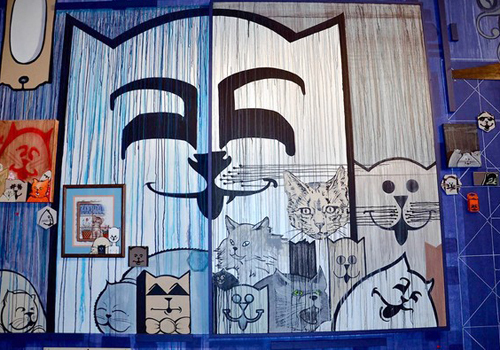 Though the cats are fairly new, Ordonez is a highly respected street artist who has been at it for 20 years. He has no desire to be recognized. Although many of the links in the comments below (mostly on/for grassroots organizations) still work, the UNDP keeps changing the URLs for the links just below in the main post here and I have stopped updating to keep up with them. All the UNDP links above for the 2012 and 2013 Gender Inequality Indexes currently work. Out of 187 countries in the 2011 Human Development Index, the United States ranks 47, the United Kingdom ranks 34, and Canada ranks 20 in the 2011 Gender Inequality Index. I knew Lord Browne– author of the Browne report which is shaping UK education policy– was a former BP exec. But I only recently learned that he’s said to be the man responsible for the brilliant cost-cutting decisions widely credited with giving rise to the Deepwater disaster. Browne is described by journalist and author Tom Bower as irresponsible for a “ruthless” programme of cost-cutting at BP that compromised safety, and thus the man most responsible for a string of major accidents including the Texas City Refinery explosion (2005) and the Deepwater Horizon explosion (2010). Yes, this is the man to turn to for wise counsel on efficiency savings. This post is a comment on the one below it. It’s like the 60’s all over again. Maybe we can get the attack on education linked to the outrageous output in wars. You have a group of students, professors and no doubt the ever guilty ‘outside agitators’ all in London protesting possible tuition hikes. So what do you do? Here’s a great idea: charge** into the crowd with horses! Won’t that show everyone you are right and they are wrong? Now, here’s the thing that gets me: at least since the student protests at Berkeley in 1964-65, we’ve had all sorts of police attacks on students. Pretty much, they do not work. There should be some lesson book that says something like, “Lots of people think of students as overly privileged, but few want to see police charging at young people who are our future.” And, as it turns out in this case, highly vulnerable. I.e., pregnant. Or so it seems. The mounted police charge** at about 1:06.